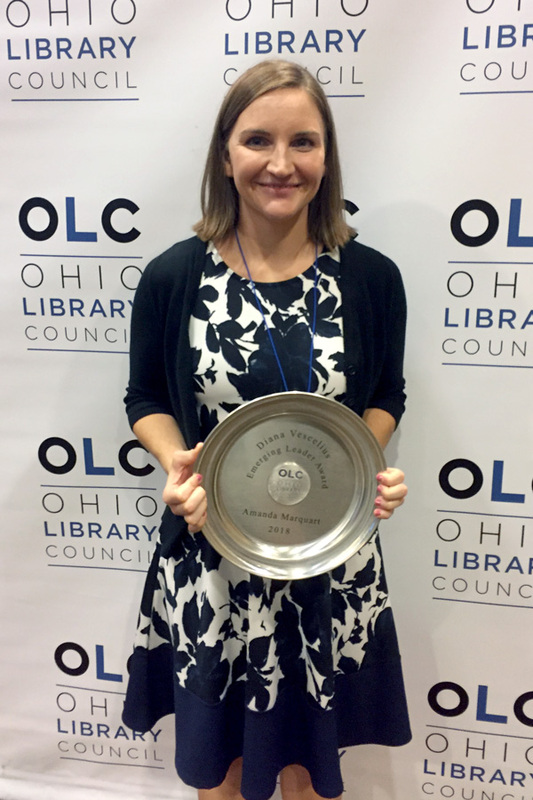 Greene County, OH: Amanda Marquart, Youth Services Librarian at Greene County Public Library, is the 2018 recipient of the Ohio Library Council’s Diana Vescelius Emerging Leader Award. The award was presented during OLC's annual Convention and Expo Awards and Honors Luncheon on Wednesday, October 3, in Sandusky. Marquart, a 4-year employee of Greene County Public Library, works at Winters-Bellbrook Community Library. In her OLC bio, she was recognized for her outreach to middle and high school students by “finding students where they are and engaging them in service activities through the library's Teen Advisory Group.” Marquart has also headed up the Pen Ohio program for the local high school, leading them to the state level of competition. Marquart’s service to the library community extends beyond Greene County. She is active in the American Library Association and Young Adult Library Services Association. Marquart is also the President of the Southwestern Ohio Young Adult Materials Review Group. The library system consists of seven locations: Beavercreek, Bellbrook, Cedarville, Fairborn, Jamestown, Yellow Springs, and Xenia.